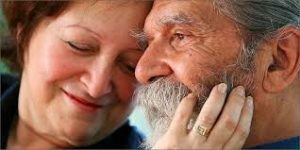 Cannabis has a lot of benefits and it’s not just used to treat countless medical conditions, diseases, and debilitating illnesses, but recent research findings from the University of Bonn of Israel and The Hebrew University of Jerusalem demonstrate cannabis’s ability to reverse the aging processes in the brains of mice. In addition, due to the antioxidant, anti-aging, and other important properties/benefits of cannabis compounds, the powerful plant is able to counter aging in many different ways. Read on to find out the top eight ways that cannabis can counter aging. According to an informative article by Herb.co, it discussed how cannabis can protect aging skin. Since the skin of our bodies is our largest organ as well as our first line of defense against various environmental stressors and pathogens, the skin is the most visible sign of aging, especially due to years of exposure to daily stress and possible sun damage. However, various studies have surfaced such as “The Endocannabinoid System of the Skin in Health and Disease” conducted by several researchers and posted by ncbi.nlm.gov that demonstrates cannabinoid’s anti-aging and anti-oxidant properties. 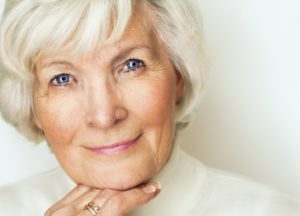 Overall, cannabinoids are potent antioxidants that can neutralize wrinkles as well as cancer-causing free radicals, which is an extremely unique aspect to the plant. Additionally, a study in the British Journal of Pharmacology found that cannabidiol has the potential to help a handful of well-known and also less-known/unspecified skin diseases. Hemp is a beneficial material and overall resource to say the least, and its oil form serves as a rich source of linoleic acid, a skin-health essential nutrient that promotes quality sebum production. Not only does hemp contain a variety of antioxidants, but it is also rich in essential Omega-3 and Omega-6 fatty acids, which is wonderful for skin health. As stated in a Huffington Post article on cannabis and the skin, as people age, the body’s skin becomes dry, loses elasticity, and even loses some of its ability to heal itself from different infections, skin diseases, and/or external viruses. Thankfully for us, hemp provides users with the necessary oils and fatty acids our skin craves as we get older. On the same note, published in the journal of the Federation of American Societies for Experimental Biology, there are findings confirming endocannabinoids’ responsibility for lipid production, thus, its ability to regulate conditions or diseases consisting of dry skin and/or acne. As discussed on ScienceDaily.com, the study demonstrates the powerful potential the cannabis plant contains, and the fact that it was able to slow down and reverse the aging process of mice is proof of this. Due to the surprising findings Zimmer and his team discovered, it raises the question and intriguing possibility that THC and cannabinoids may act as anti-aging molecules in the brain. Of course, further research and studies need to be done on humans, but as soon as later this year, human testing will take place in Germany by Andreas Zimmer and his colleagues. Cannabinoids not only possess anti-aging properties, but according to articles by SensiSeeds.com and The Ageless Beauty Report, cannabinoids are able to improve the efficiency of the body’s mitochondria aka the energy source for cells. As stated in previous CBD studies and discussed in The Ageless Beauty Report, on a molecular level, cannabinoids regulate mitochondrial activity, act as antioxidants, and modulate processes, which remove harmful macromolecules from both the brain and central nervous system tissue. As a result, an oxygen cleanse occurs, which reduces the brain’s aging process while also playing a role in increasing brain activity, according to a CBD study done by Raphael Mechoulam, a long-time cannabis researcher and writer of over 400 published scientific papers. Due to CBD’s destruction of free radicals, the mitochondria can function properly. When people get older, oftentimes their bones get weaker, they experience some level of joint and/or muscle pain, and perhaps even inflammation and swelling. However, research findings have shown that cannabis can significantly reduce joint swelling in addition to relieving pain for both osteoarthritis and rheumatoid arthritis sufferers. 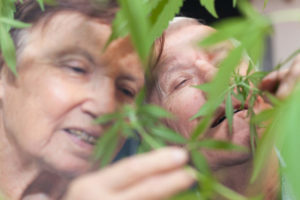 The anti-inflammatory properties and immune system modulating qualities cannabis contains is unique to say the least, and it can help older people feel younger while combating the pain/discomfort that often comes with aging. Regarding the anti-aging mice study, a handful of researchers including Mark Ware, a clinical researcher at McGill University stated the following in a Scientific American cannabis article, “We know the endogenous cannabinoid system’s (ECS) primary function is to try to preserve homeostasis within a given brain circuit. It works like an internal regulator; when there’s too much neuronal activity, cannabinoids suppress activity to prevent neurotoxicity.” In other words, it is possible that restoring the protection in place may help safeguard the brain against cellular stress and pain that contributes to aging. All components of the cannabis plant serve a purpose, and the combination of each component has a role to play in the maintenance of healthy skin. For instance, in the anti-aging cannabis article by Sensiseeds.com, it mentioned that the endogenous CB2 receptor has demonstrated its ability to reduce itching and irritating skin issues like psoriasis and eczema. With the right amount of THC, CBD, and other endocannabinoids, the human body can fight the external and internal aging process in addition to preserving clear and healthy skin with enough of necessary oils, lipids, and fatty acids. Overall, the cannabis plant contains an overwhelming amount of powerful benefits, anti-aging and anti-oxidant properties, as well as positive uses for people of all ages, especially those experiencing the aging process and the struggles, pain, and discomfort that comes with it. For the future, people should think twice about the many uses of the cannabis plant beyond just THC and how it can positively impact a person’s daily life. Why Is Cannabis Microdosing Is Good?